Since 2016 the young vocal ensemble has made a name for itself in the German barbershop scene, both acoustically and visually, always in the freshest style. 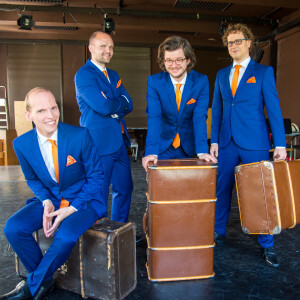 With their ensemble sound rich in overtones, which is a powerful melange of excellently corresponding individual voices, the four singers from all corners of Germany inspire their audience in front of large or intimate backdrops – the good mood in front of and on stage is of course included! A concert with the Barberpapas is always an experience of the most entertaining kind with very varied and excellently selected music. From traditional to pop music and musicals, all tunes always sound in traditional, dense and energetic barbershop style. Since their foundation, the Barberpapas have rehearsed regularly in the rooms of the time-honored Folkwang University of the Arts in Essen. Further information can be found at www.barberpapas.de. Barbershop is an American kind of a cappella music that was created at the beginning of the 20th century in American barbershops. There they improvised and harmonized to catchy melodies. In addition to the four-part genre, this a cappella genre is characterized above all by tight chords (“Close Harmony”) and sophisticated and sonorous arrangements that support the wonderfully overtone-rich and powerful sound of this genre. Jan Liermann (*1987) studied school music and musicology with a major in choral conducting at the Folkwang University of the Arts in Essen. Active participation in master classes with Peter Phillips (The Tallis Scholars), the Hilliard Ensemble and the Swingle Singers, among others, enriched his education. Since 2017 he has been working as a music teacher at the Protestant Seminary in Blaubeuren, where he leads various ensembles. His musical spectrum ranges from medieval choralschola, classical chamber choir and vocal soloist ensemble to jazz a cappella band. In 2012 he founded the young chamber choir “NyKlång” in Essen. As a German conductor he accepted the invitation of the annual international choir academy “In Terra Pax” in Międzyzdroje/Poland in 2015 and 2016. In 2016 and 2017 he was a scholarship holder of the European Youth Choir Festival EJCF in Basel. André Biermann (*1981) is a genuine Englishman and studied special education at the universities of Bielefeld and Dortmund. He worked at various remedial, secondary and primary schools in Essen and has been working as a special education teacher in Herford County since 2016. In his childhood he devoted himself intensively to the accordion and the horn. In 2003 he discovered his passion for singing and since then has been active as a tenor in many choir projects and ensembles. Among other things, he was a member of the NRW State Youth Choir for many years and was able to develop his vocal skills considerably here. In 2011 he founded “Never8” a mixed octet. From 2012 to 2014 he received singing lessons from the Essen baritone Tobias Scharfenberger. Through regular vocal training he works continuously on his voice and also appears as a soloist from time to time. Fabian Strotmann (*1985) is today one of the most versatile soloists of his generation in Germany. After studying school music and Gesangspädagogik he devoted himself to an artistic master’s programme at the Folkwang University of the Arts in Essen. Already during his studies he attended master classes (The Hilliard Ensemble and The Tallis Scholars, among others). He then worked with conductors such as Helmuth Rilling, Florian Helgath and Andrea Marcon and is regularly active with the RIAS Chamber Choir, the NDR Choir and the SWR Vocal Ensemble. As a sought-after concert soloist, he is a welcome guest in the most important centres of classical music. His main focus is on lyrical tenor roles in oratorio and concert music. In 2016 Fabian Strotmann made his American debut in the modern opera “De Materie” by Louis Andriessen at Armory Hall New York. Lucas Bitzer (*1985) studied physics with a focus on MRI acoustics at the Friedrich Schiller University of Jena. He then devoted himself to his doctorate in the field of photovoltaics and has been working as a mathematics lecturer at the Karlsruhe Institute of Technology (KIT) since 2017. He enjoyed piano lessons at an early age and gained his first stage experience in the children’s choir of the Frankfurt Opera at the age of 10. In 2004 Lucas founded the Barbershop Quartet “Halftones”, with which he won the European Barbershop Championships in 2013. Through multiple participation in the European Directors College and the Harmony University in Nashville (USA) he was able to further his education in the field of barbershop and a-cappella. In addition, he was and is a member of several classical selection ensembles.